Published in the South Kent Gazette, 23 July, 1980. A prominent feature of the seafront to this day is Waterloo Crescent, most of which is made up of the White Cliffs Hotel and the Dover Harbour Board offices. In one of the properties which were built in 1834, the Duke of Connaught made his home when he was an officer of the Dover Garrison. In the wide space in front Dover children gathered to serenade him on the morning of his birthday, the 1st May, 1872. The staging of promenade band concerts in Granville Gardens by the Corporation and the opening of the Promenade in 1893 opposite Clarence Lawn were milestones in Dover’s efforts to attract visitors. But the Promenade Pier had a disastrous career financially. In November of the year it opened there was serious damage to the pier and a lighthouse at the end was overturned when the four-masted ship Christine, a full-rigged ship from Bremen, put into Dover to land a pilot and collided with the pier. The Daily Graphic reported that “The vessel struck the pier-head at right angles, carrying away the lighthouse as fairly as though she had steered for it. The ship lay entangled in the structure for some time; actually taking the ground shortly after the collision.“ The ship was eventually released, with the aid of a tug, as the tide rose, and was able to continue on its voyage, but there was a 40ft.-long breach-in the pier and damage was estimated at £800. In 1925 the pier was again seriously damaged by a steamer which collided with it and, being otherwise in bad state of repair the Harbour Board, who had it handed over to them by the Admiralty, decided to demolish it. This was carried out between June and November 1927. The Admiralty had acquired the pier in 1913 and it was used during the first world war for naval purposes. New Bridge, the wide approach from the centre of the town to the sea, is a short thoroughfare, yet its history and traditions extend back to the Roman period. The name, New Bridge, does not, at first glance, seem very appropriate, for the bridge, although it exists, is invisible and not new. In justification of the name, however, it may be mentioned that the bridge, and the river which it spans, were visible until the year 1840; the northern parapet was then removed to make room for houses, and the western parapet was taken away when Northampton Street was opened in 1852. Part of the bridge, and the river became visible again in recent years when New Bridge property was demolished to build the Townwall Street dual-carriageway. The bridge itself was built in 1800, and was then called “New“ to distinguish it from Buggins’ Bridge, which previously existed, a little further up the river. Standing at New Bridge, watching the ever-changing scene—throngs of pedestrians, the coming and going of electric trams, carriages, carts, waggons and trolleys carrying cargo from the harbour, the galloping of horses, and the tramp of foot soldiers, we are (wrote the author in 1904) in the vortex of Dover’s teeming life. That was still true 35 years later but by then the trams had gone and, with the growth of motor traffic, which first made its appearance in the town on 15th November, 1896, horse-drawn traffic had practically disappeared. By the second world war traffic was a good deal heavier due to the growing number of Continent-bound motorists heading for the cross-Channel ferries. 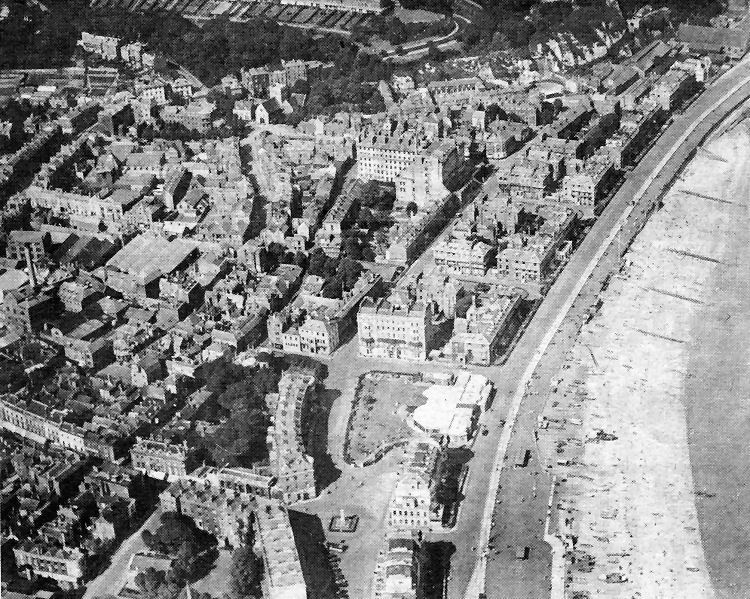 An aerial view of the seafront area taken on a sunny day in 1931. In the foreground is Bench Street and New Bridge and the Rifle Monument. Nearby is Granville Gardens, facing which and the sea, is Camden Crescent and, on the corner of Wellesley Road, the Grand Hotel. A natural continuation of Camden Crescent then, was Liverpool Street which extended along the site of what is now the rear of The Gateway to the back of Marine Court. To the rear of that property can be made out the round shape of the foundation of a gas holder at the former Trevanion Street gas works. Other features of Interest are the massive Burlington Hotel, which is nearby, old St James’ Church, the malthouse complex on the site now being developed by MFI, the Phoenix Brewery near the Market Square, and the water mill off Townwall Street. Dating from the early 1920s is the view above of the Granville Gardens during a band concert. On the right is the entrance to the Promenade Pier which was demolished in 1927.